Martha Tinker's given name is also seen as Pattie. 1 The National Cyclopaedia of American Biography, Volume 28, New York: James T. White and Company (1940), 184, Hathi Trust Digital Library. 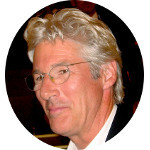 2 Roberts, Gary Boyd, "#74 Royal Descents, Notable Kin, and Printed Sources: The New England Ancestry of Actor Richard [Tiffany] Gere", (accessed 10/09/2014), New England Historic Genealogical Society (Online Database).